October 25, 1996. 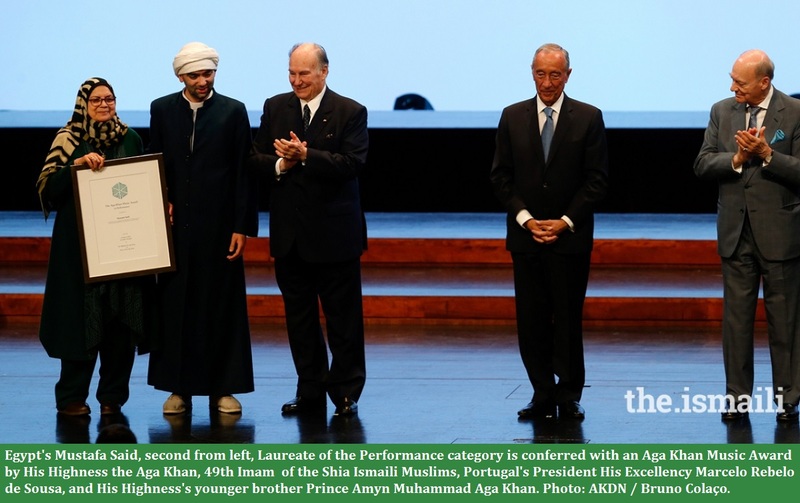 Prince Amyn Mohammed Aga Khan (left) pictured wiith his brother His Highness the Aga Khan at the Hadrian Award Ceremony. Introduction: Though discreet and always working behind the scenes, Prince Amyn’s contribution to the Imamat institutions have been influential and impactful. In Simerg’s continuing series on thanking Ismaili historical figures, Azeem Maherali of Atlanta, USA, gives a rare glimpse of a remarkable contemporary historical figure from the Imam’s family whose commitment for human dignity and humanism is reflected by his creative ingenuity in multiple dimensions of human endeavor. While I was still a “toto”, my mom frequently showed me and my brother pictures of the Noorani family and told us how you were always by Mawlana Hazar Imam’s side. I can honestly not remember seeing any pictures of Mawlana Hazar Imam without you, until well after he became the Imam, requiring him to travel extensively to see the jamats while you were still at Harvard. This sentiment carried on in the stories that my father shared with us, about Mawlana Sultan Mahomed Shah in the 1950s sending Mawlana Hazar Imam on special missions to visit the jamats in East Africa and South Asia. Even then, you were always with him. Then later on in the late 1960s, when Mawlana Hazar Imam informed the world wide jamat of your decision to leave the United Nations and to join the Imam in improving the quality of life of the jamats everywhere, the jamats were jubilant. Subsequently, various jamats had the good fortune of being in your presence on various Imamat related works, and at times you brought special messages from our beloved Hazar Imam. For more than four decades now, perhaps even longer, you have dedicated your entire life in the service of the Institution of Imamat, channeling your leadership and energy in numerous Imamat endeavours benefiting both jamati and non-jamati constituencies. Given that Mawlana Hazar Imam rarely speaks about the work of the members of his family; graciously directing compliments to the jamati leadership and countless volunteers, I do recollect a very rare instance that took place in Lisbon in July 1998. Mawlana Hazar Imam referring to you stated that he deeply valued your time, talent, thought and creativity for many of the exceptional projects that had been developed for the Jamats around the world. Mawlana Hazar Imam continued to say that in many ways you exemplified the true spirit of service in Islam – seeking no recognition. Prince, we have witnessed and continue to witness your immense love, loyalty and respect for our beloved Hazar Imam. You continue to be an epitome of inspiration in the service of the Imam, the Institution of Imamat, worldwide Jamats, greater Muslim Ummah and humanity. You are “living history”: Brother par excellence; patron of arts and culture; trusted advisor to many; trustee of civilizations past, present and future; an optimistic yet pragmatic futurist; and a great humanist; highly regarded and well-liked by many. Even as I say, “I thank you and celebrate you!”…emotions, feeling and words fail in my efforts to express my sincerest appreciation for the tremendous work that you are doing. The constellation of your engagements, activities, appointments and accolades, is a humble attempt to provide a short tribute to you, however inadequate as it may be. Date of birth: September 12, 1937. Relationship to Head of Family, His Highness the Aga Khan: Younger brother of His Highness the Aga Khan (born December 13, 1936), direct descendant of Prophet Muhammad (s.a.s.). Father: Prince Aly Soloman Khan (1911 – 1960). 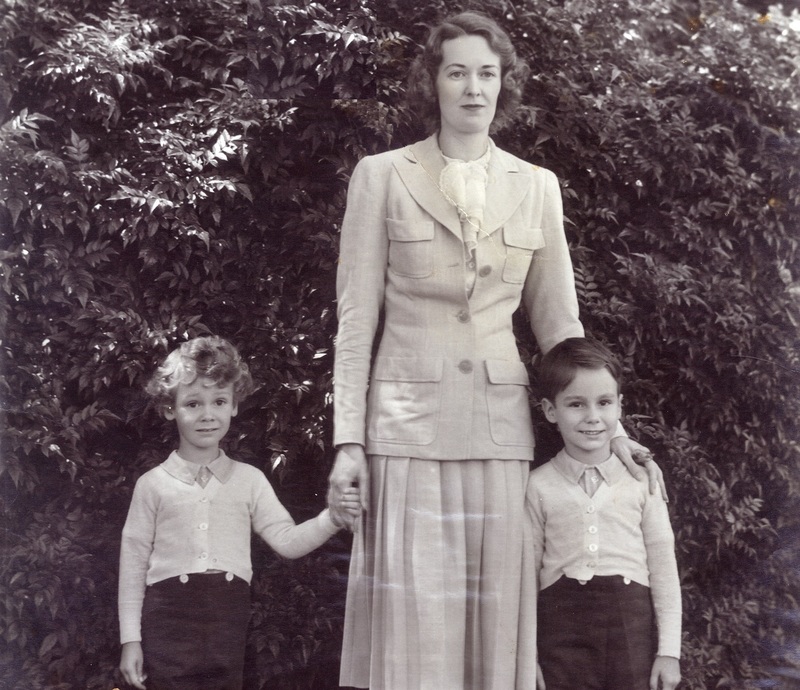 Mother: Princess Tajudawllah Aga Khan (1908–1997). Sister: Princess Yasmin Aga Khan (born December 28, 1948). Uncle: Prince Sadruddin Aga Khan (1933 – 2003). Niece: Princess Zahra Aga Khan (born September 18, 1970). Nephews: Prince Rahim Aga Khan (October 12, 1971), Prince Hussain Aga Khan (April 10, 1974) and Prince Aly Muhammad Aga Khan (March 7, 2000). 5. Chairman of the Aga Khan Museum (AKM) Oversight Committee. II. Aga Khan Association for Ismaili Scouts , Karachi, Pakistan. 3. Cercle Cressent (Crescent Circle) Patron. 4. Advisor to the Silk (Road) Encounters Project Educational Programs. 1. Member of the Board of Trustees. 1. Member of the Advisory Board. Officer of the Order of Arts and Letters, by the French Minister of Culture and Communication, M. Frédéric Mitterrand, 2010-11-09. I have the very great honour of welcoming you here today as individuals who are cosmopolitan in essence, pluralist by religion, and outward-looking through education, and who have magnificently perpetuated a long family tradition of advocating pluralism and social and cultural engagement throughout the world. Of Italian and British parentage, your culture is Indian, you grew up in Nairobi and were educated in Switzerland and America: the planet is truly your home; openness, tolerance and inter-faith dialogue are your heritage. You have each made your mark on the contemporary world. “It is an immense pleasure and a real honour to pay tribute tonight to a man of the arts, a man of refinement with a keen interest in heritage, and a passionate devotion to French and international culture. “A worthy heir to a family that continually expresses its support for cultural pluralism and has been involved in international work for several generations, you are today the head of many prestigious institutions working to improve the lives of peoples across the world. Like your grandfather, who was President of the League of Nations, and your father, Pakistani Ambassador to the United Nations, after attaining academic success, you now work within the prestigious institution that keeps daily watch on the world, the same United Nations, where you have been a member of the Economic and Social Council since 1965. “In 1968 you were already bringing your dynamism and open-mindedness to the administration of the Imamat’s main development institutions. The strength of your international network and the influence you have demonstrated enable you to play a crucial role there, notably within the Aga Khan Development Network. 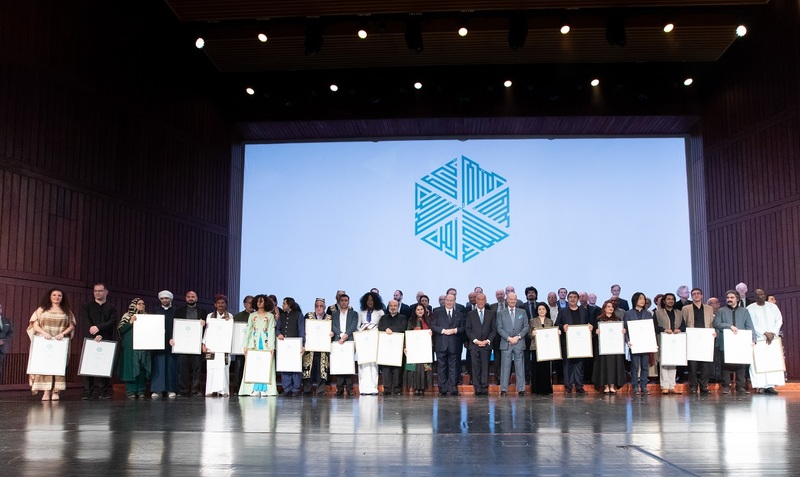 As a Director of the Aga Khan Foundation, your work in over fifteen countries has enabled you to strengthen and modernise the philanthropic tradition of the Ismaili Muslim community. 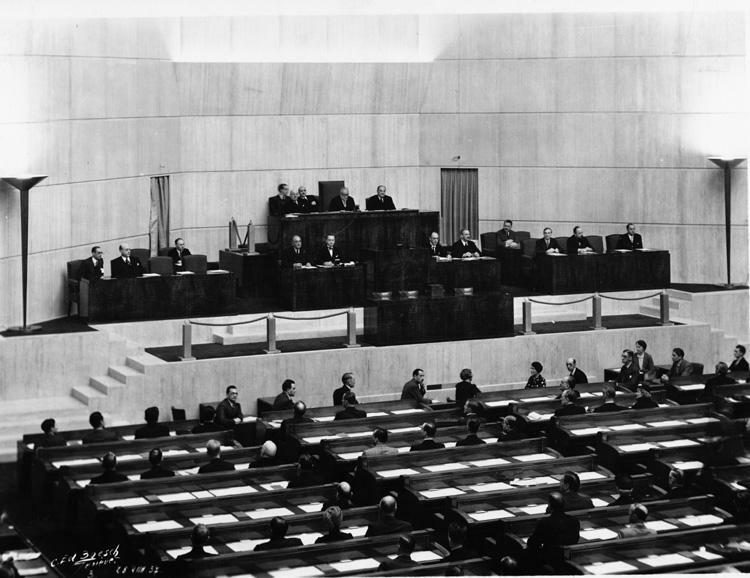 Eighteenth Assembly of the League of Nations. The first session in the new hall showing the rostrum with Prince Amyn Aga Khan’s late grandfather, Sir Sultan Mahomed Shah Aga Khan, in the presidential chair, and on his right the Secretary General. Geneva, 1937. Photo Credit: UNOG Library, League of Nations Archives. Copyright. Reproduced with permission. “As a member of the Board, and Executive Committee Chairman of the Aga Khan Fund for Economic Development (AKFED), which aims to promote entrepreneurship and the creation of healthy, sustainable economic organisations in the world’s developing regions, you have brought a new vitality and fresh opportunities to populations too often forgotten or isolated. You generously believe that any return on investment must benefit the populations of the countries involved, and them alone. “You have also, with exemplary dedication, contributed to the development of Tourism Promotion Services (TPS), which seeks to develop tourism in certain areas of developing countries, notably in more isolated regions, by building, renovating and managing the tourist accommodation that is crucial to the vitality of local economies. “I must not forget your function as administrator in an institution dear to my own heart: the World Monuments Fund (WMF), the world’s leading private international organisation devoted to the preservation of historic monuments and sites on all five continents…. Photo taken at the opening on 15th September 1959 of the 14th session of the United Nations General Assembly. Seated at the head of the delegation of Pakistan is Mr. Manzur Qadir, then Minister for Foreign Affairs. At right is Prince Amyn Aga Khan’s father, the late Prince Aly Khan, Permanent Representative to the United Nations. Photo: United Nations Photo Library. “Lastly I should like to recall, of course, your work as a patron of French culture and heritage. As a great art collector, with an informed passion for heritage, you regularly work alongside prestigious institutions to support them in carrying through their cultural projects. “The renewal of the partnership agreement between the Patriarchate of Lisbon and the Portugal chapter of the Aga Khan Foundation represents yet another milestone in the long-standing relationship that the AKF, the wider Aga Khan Development Network and indeed the Ismaili Imamat have enjoyed with the Patriarchate of Lisbon, as well as the secular institutions of this country. The focus of our joint efforts to date has been on helping those who face poverty as well as economic and social exclusion. The initiative, as many of you know, involves 20 entities associated with the Catholic Church that have been traditionally involved in alleviating poverty and assisting those in need. The noble tradition of helping the less fortunate has also been interwoven into the history of the Ismaili Imamat and its institutions worldwide. “ … The general framework for the creation and efficient operations of such Civil Society Organizations lies, in our view, in what we call an Enabling Environment and here local governments have a role to play, by ensuring legislation and its enforcement that encourages and protects private initiative and entrepreneurship and by supporting, with all the means at their disposal, the creation of an active and buoyant private sector. “AKDN unlike many other development agencies, gives equal weight to both the for-profit and the not-for-profit sides of our work, seeking to create models, set benchmarks and standards and develop local human resources. … Sustainability is central to our mission, whether it be in microfinance institutions or in medical and educational institutions or in restored historical sites, monuments and urban parks; and we believe that discipline, both financial and operational, cost-effective budgets, all the necessary control systems, appropriate planning and strategic positioning, transparency and good governance are all essential. All our initiatives, be they economic, social or cultural, aim to generate new income for the residents of the areas in which we work and to improve the quality of life of the population where we work. When we withdraw from our projects or programmes we seek to leave behind institutions and a civil society that are, or have become stable, competent and self-reliant. “Our overall goal has been to build new capacity and pluralist civil society institutions for the transition from humanitarian relief to a sustained self improvement in quality of life, characterised by a freedom of choice and opportunity that is offered to each individual. “The Ismaili Centre which unites in its construction and décor the experiences and aesthetics of the past with the materials of the present in order to meet the needs and objectives of the future, would seem an ideal venue for this conference, and that, all the more so, as in this Centre, we will aim to promote exchanges of knowledge, of creativity and of experience in the pursuit of excellence and of wisdom.
. Prince Amyn Muhammad, by Farshid Machiwala. Please click Prince Amyn Aga Khan.
. Founded by Louis XIV in 1669, Opera National de Paris is a reputed company that produces classical ballet and modern opera.
. Musée des Arts Décoratifs (Museum of Decorative Arts), a museum of the decorative arts and design, located in the Palais du Louvre’s western wing The museum collection was originally founded in 1905. Today, boasting some 150,000 objects, the collections are privileged testaments to the French art of living, the savoir-faire of its craftsmen and industrialists, the research and creativity of its artists, the passion of its collectors, the generosity of our donors and the desire to pass these riches on to others.
. World Monuments Fund (WMF) is the leading independent organization dedicated to saving the world’s most treasured places. WMF’s mission is to preserve the world’s architectural heritage of significant monuments, buildings, and sites. Since 1965, in more than 90 countries, WMF experts have been racing against time, applying proven techniques to preserve important architectural and cultural heritage sites around the globe.
. The Silk Road Project is an internationally minded performing arts nonprofit with cultural and educational missions to promote innovation and learning through the arts. Cellist Yo-Yo Ma founded the Project in 1998 taking inspiration from the historical Silk Road trading routes and using the Silk Road as a modern metaphor for sharing and learning across cultures, art forms and disciplines.
. The New Cities Foundation (NCF) is a global platform for innovation and exchange on the future of urbanization. The NCF is guided by the principle that the unprecedented rate of urban growth that defines the 21st century represents a unique set of challenges as well as a chance to build more sustainable, vibrant, innovative and equitable communities in the developed and the emerging world. NCF sees cities as humanity’s most important source of innovation, creativity and wealth-creation. NCF believe that achieving the vision of building more sustainable and dynamic urban communities can only be done through innovative partnership. NCF serves a unique role in developing new models of collaboration between the public, private and academic sectors.
. Sotheby’s was founded in London on March 11, 1744. Sotheby’s quickly expanded beyond books to include the best in fine and decorative arts and jewellery. 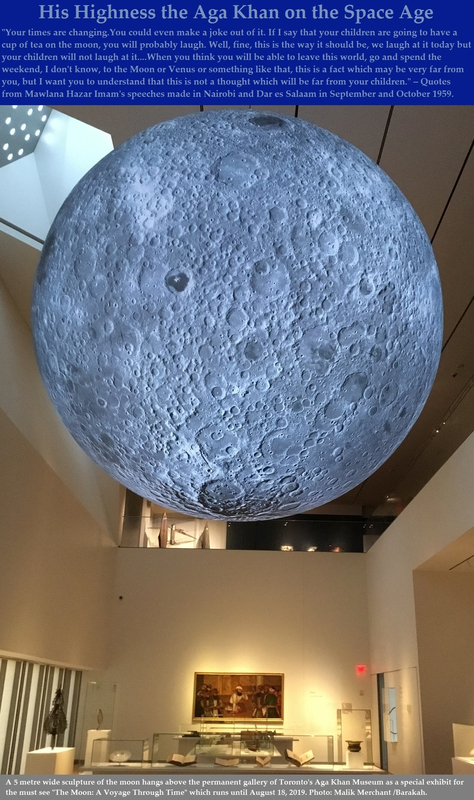 Since 1744, Sotheby’s has distinguished itself as a leader in the auction world.
. All speech excerpts of Prince Amyn are taken from the website of www.akdn.org, unless otherwise specified.
. The Ismaili – Prince Amyn Address and The Ismaili – Prince Amyn Economic Forum. We welcome feedback/letters from our readers. Please use the LEAVE A REPLY box which appears below. Your feedback may be edited for length and brevity, and is subject to moderation. We are unable to acknowledge unpublished letters. Please visit the Simerg Home page for links to articles posted most recently. For links to articles posted on this Web site since its launch in March 2009, please click What’s New. Thank you for his amazing insight on Prince Amyn’s contribution….keep up the good work!!! Thank you for sharing this wonderful insight into the life and hard work of Prince Amyn Aga Khan. The article made me aware of the true meaning of the word ‘fidai’ – one who seeks no reward for their service to the Imam. It was indeed kind of you to come with this letter of thanks. The noorani family know that we heartily appreciate all their works and involvements. I was a Volunteer in the Aga Khan Hospital and I have a photo with Prince Amyn in 1992. I hope you will get this photo from hospital’s photo library. Your letter of thanks and appreciation pertaining to the services of Prince Amyn Mohamed contributed to the Imamat will always be admired and treasured in our hearts. I would now love you to write a similar letter of thanks and appreciation to Princess Zahra Agakhan who has worked and devoted all her time and energy numerous sector through aegis of AKDN for the benefit of our Ismaili community and all human beings globally. A true heir to the Prophet. Moe Merani. Niagara Falls, Ont.Canada. I would like to convey my thanks to Mr. Azeem Maherali for the excellent letter he has written to our Prince Amyn. I was very happy & delighted to read about Prince Amyn’s outstanding and magnificent contribution to the Ismaili Imamat and its institutions. And a special thank you, to our beloved Prince Amyn, for his untiring work for the Imamat, and standing shoulder to shoulder, with our beloved Imam. I would like to convey my best wishes to Mr. Azeem Maherali for the excellent letter he has written to Prince Amyn Aga Khan for Simerg’s Thank You Series. I was delighted to read about Prince Amyn’s outstanding and magnificent contribution to the Ismaili Imamat and its institutions. It certainly has been an inspiring research project. More “Constellations … ” in the works. Thank you Prince Amyn. I appreciate your work so very much. I had imagined his intellectual brightness from what little I had read. I had wondered at the vastness of his untrumpeted achievements, based on a few glimpses here and there. I had even heard about his prowess at table tennis! This is a wonderful effort to articulate the profound sense of gratitude towards somebody who is an evergreen pillar of strength, a symbol of voluntary service without recognition and indeed a beacon of the spirit of Islam. That’s very thoughtful of you to come up with this letter of thanks….the members of Mawlana Hazar Imam’s family should know that we do appreciate all of their untiring works and involvments.